I promise, im not fishing for compliments, I genuinely don’t like this painting – and that’s ok. I want to keep working on this one because there are so many different techniques involved here that I want to improve on. In the distance, I want to create the impression of atmosphere. 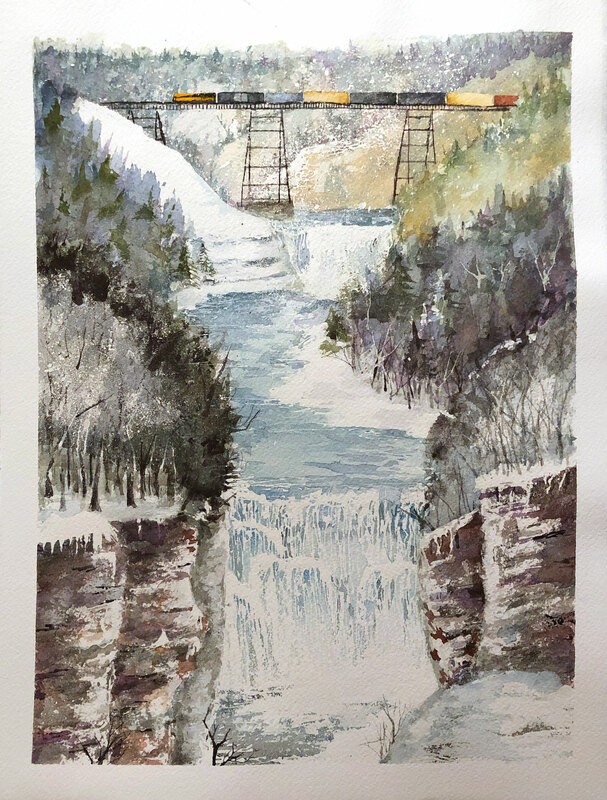 I’m trying to do it with a few techniques: 1) reduced detail; 2) colors influenced by the color of the atmosphere; 3) splattered masking fluid; 4) reduced sizes of the trees. Each of these I’m making mistakes on: 1) I’m putting in too much detail. 2) I keep coming back to the background, which ends up creating darker values. 3) The splattered masking fluid is not controlled. I should not have splatters on the nearer cliff. 4) When I go back to “fix” the distant hills, I’m painting trees trees and they are too detailed and too big. In the mid ground, I am trying to recreate the cool colors in the photo, but they end up feeling too light compared to the background. In an attempt to bring them forward, but keep them cool, I try deepening the values. They then end up getting the same value as the distance. Which means the foreground ends up needing to be nearly black in order to provide value contrast. The whole thing ends up feeling very very flat. The cliff faces were overworked. I need to paint those in one, maybe two passes. Don’t worry as much about representing the cliffs perfectly – paint what they feel like. The trees on the left are far far far too dark. In my reference photo they are nearly white with snow. Here, they are plague moddled black. The waterfall almost works. I liked the waterfall in my first painting, but it didn’t match what I see in the photo. In my first painting the waterfall is a single curtain of water. In reality, the waterfall is composed of many small waterfalls – I tried to represent that here, but maybe the “top” of each waterfall should be blue, with white mist above it. I like the bridge. I tried to paint it very carefully this time in order to get straight lines, and I feel like I was successful there. I also like the shading on the train cars. They don’t feel like blocks to me here. I also like the idea, but not the execution, of the trees at the bottom of the cliffs in the foreground. They help provide a sense of scale and perspective. Unfortunately, every tree in this painting is essentially the same size, so they don’t do these things well in this picture, but I can see how they would if I were more successful with them. I’m going to try again, and this time I am going to try to follow some rules. 1) only mask the waterfalls, and the trains. 2) The background and cliffs I will do in two passes – no more – both washes. 3) The mid ground will be three passes, a wash, a wash of shadows, and a final pass with detail. 4) The trees in the foreground will be a single pass, only detail, hopefully that will make them appear more like bare branches against snow.